A project that began in 2014 is finally nearing completion, with one last boost from the Southeast Overtown/Park West Community Redevelopment Agency (CRA). 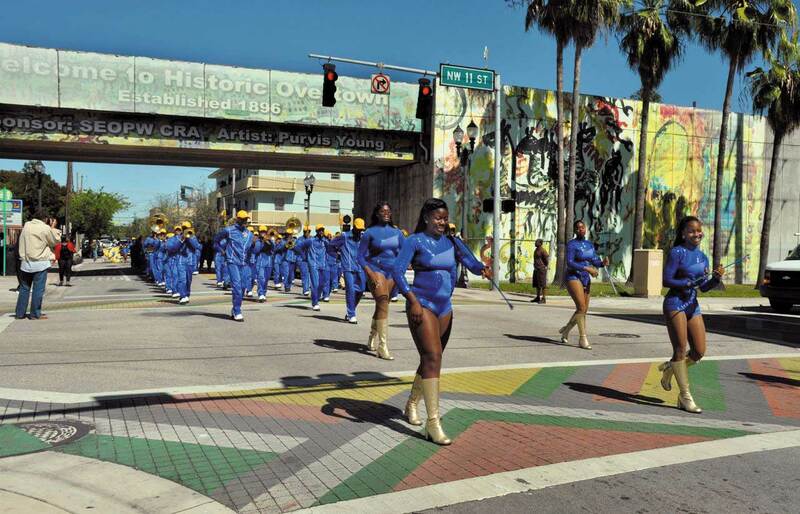 CRA directors voted unanimously June 26 to spend an additional $10,000 to have artist Addonis Parker finish “Vintage Settlers Colored Town,” a hand-painted mural depicting late pioneers and Overtown businesspeople, on a Metrorail guideway at Northwest Third Avenue and 11th Street. The total project cost is about $112,000. It replaces a faded shrink-wrap art work, circa 2007, installed along four large walls. Creative Commercial Insight and Restoration Inc., a company managed by Mr. Parker, “has experienced significance delays due to weather impediments during the summer months… high costs for supplies, and theft and vandalism,” said a CRA memo that accompanied the request for more funds. The company “has provided the CRA with an itemized budget outlining the expenditures thus far and a proposal to complete the project,” the memo continued. Mr. Parker has extensive experience with murals and other art in outdoor venues, including transit stations, according to CRA documents issued in 2015 when he won a “call to artists.” A resumé submitted to the agency listed more than 30 public mural commissions in schools, parks, libraries and housing facilities. The company is also a vendor to Miami-Dade County’s Art in Public Places, has worked on numerous art restorations throughout the county, including many in Metrorail stations, and pledged to hire at least five Overtown residents to help remove the old shrink-wrapped installation. The budget was originally not to exceed $120,000. Agency director and Miami commissioner Frank Carollo said he was “a little sticker-shocked” by the cost then, and directors briefly debated whether the CRA could get an artist to do it free in exchange for recognition. “Let me dispel the notion that this will be free,” said Clarence E. Woods III, CRA executive director, at that time. what a joke Keon, how about People’s BBQ. First a $45K, then a $1M grant. this, after it was shut down by the health dept. And, the bldg is pretty new, so what could possibly have the S1M been spent on? And, it seems, two years after the $1M, it is closed (or is that temporary? If so, the owners don’t even state so anywhere online). … not to imply these kinds of abuses like the CRA’s Overtown, uniquely wastes taxpayers dollars on insider favors.